Cooking whole fish is awesome. Whether you steam, roast, or grill it, the fish ends up being very fresh, delicious, and healthy. It is also great for entertaining. Growing up, my parents cooked whole fish all the time and had spring roll parties and hung out with friends and family over a couple of beers. For this citrusy whole grilled fish recipe, instead of a spring roll party, we had a fish taco party and enjoyed it with shots of tequila and Mexican beer. I saw Guy Fieri cook this on his show Guy’s Big Bite. Instead of topping it with just squeezed lemon, I topped it with a refreshing citrus salsa. 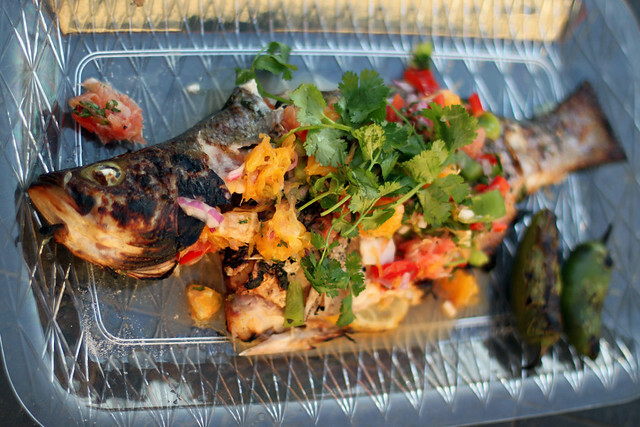 The delicious grilled flaky fish along with the colorful citrusy salsa and fresh citrus flavors is delightful. 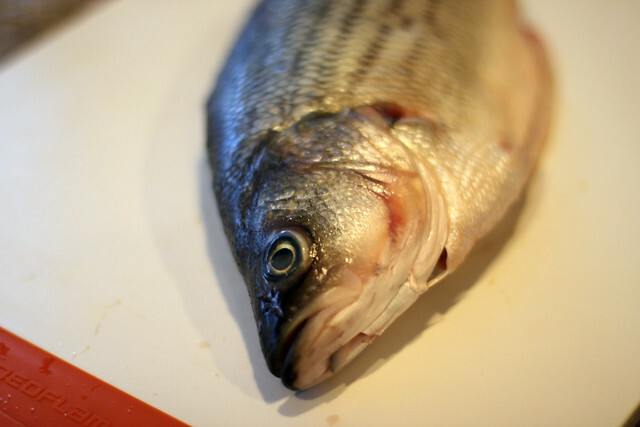 If you don’t like striped bass, I think it should work with other whole fish like talapia or red snapper as well. Note: Make sure to oil the grill grate well to avoid fish from sticking to the grill. 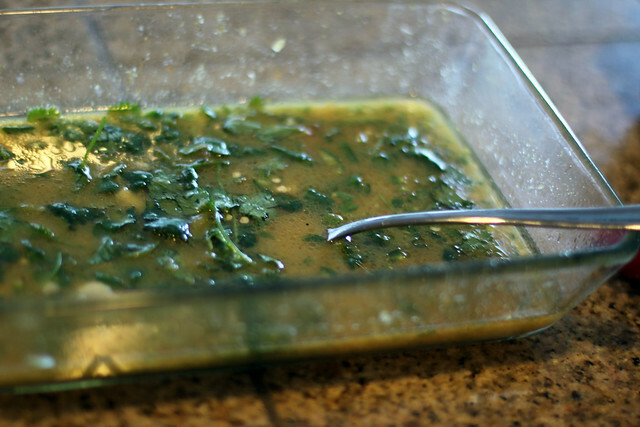 In a 9×12 baking/serving dish or re-sealable bag, add orange juice/zest, lime juice/zest, lemon juice/zest, grapefruit juice/zest, oil, honey, cilantro, jalapeno, garlic, 1 teaspoon, and 1 teaspoon of pepper and mix well. 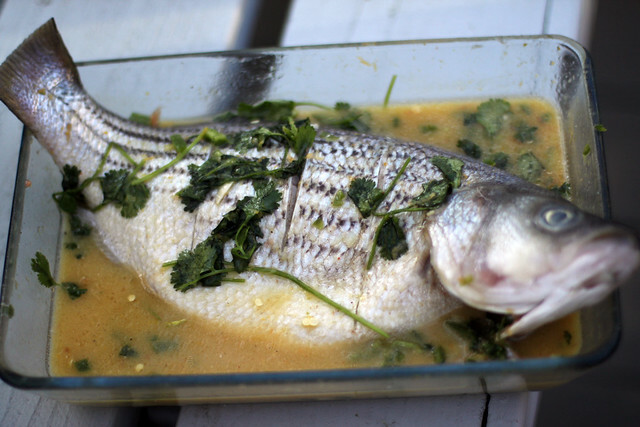 Add fish to the marinade, allowing the marinade to coat the fish and get inside the fish. Cover and refrigerate for at least 30 minutes. Flip the fish halfway through to ensure both sides of fish gets marinated evenly. Fill the charcoal chimney starter with ¾ full of charcoal briquettes. Light and let the chimney starter do its thing until the charcoal turns gray. To set-up the coals for indirect cooking, bank the coals along only one side of the grill. Put the grill grate back on the grill. Clean grill and oil the grill grate by using a paper towel, rub the grill grates liberally with the oil. Remove the fish from the marinade and stuff the cavity with the lemon slices and some more cilantro. Place whole fish over indirect heat, close the lid and allow the charcoal grill to essentially bake the fish for 20-25 minutes. While fish is cooking, combine all ingredients for the citrusy salsa and set aside. Open the lid and grill fish over direct heat for a little char if desired. 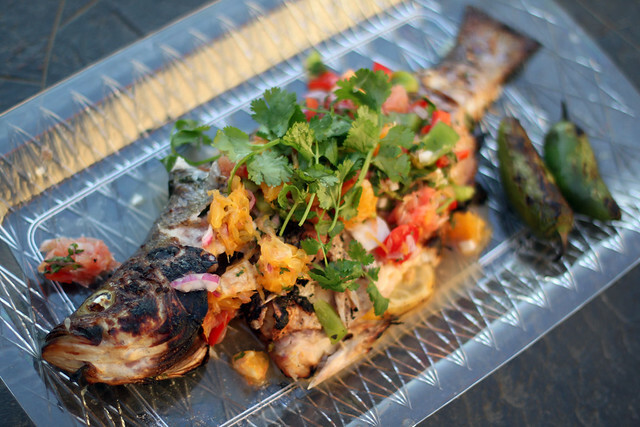 Remove fish from the grill and top with citrusy salsa and squeeze lime or lemon juice over top. Serve with Tortillas or rice.